Skyrocketing healthcare costs coupled with the ubiquity of cellular phones have contributed to the phenomenal increase in the use of mobile technology for medical-care purposes. In 2017, 325,000 mobile, health apps were available, notes the Global Mobile Health Trends and Figures Market Report by Research2Guidance, a Berlin-based, mobile-app-industry consultancy. At least half of all smartphone and tablet users will download a mobile, health app this year, concludes the report. From EKGs to X-rays to cancer detection technology, medically enabled self-diagnosis is as accessible as a mobile phone. Medical researchers and technology giants have collaborated to develop a growing number of medical apps and attachments that harness smartphone technology to create professional-grade mobile health devices. These developments constitute the largest segment of the mobile health market, forecast to be valued at $33.59 billion by year-end, according to Statista, a leading provider of market and consumer data. And while healthcare professionals warn against substituting self-diagnosis for regular in-person visits with a health provider, the practice of self-diagnosis can save consumers time, money and possibly their lives. Many of the latest mobile health apps can differentiate between medical emergencies and non-emergencies, perform medical tests and screenings at a fraction of standard costs, and provide early identification of illness and disease. 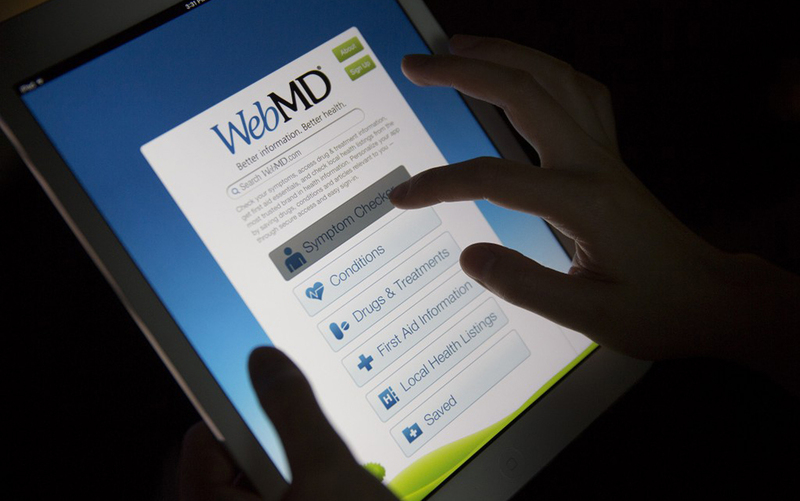 The WebMD Symptom Checker app allows users to list symptoms they are experiencing and see a list of possible health conditions that may be causing those symptoms. Curiscope is an app that works with a companion ?smart tee shirt? to view inside the human body with a mobile phone camera. Users can see bones, organs and vessels to identify fractures, masses or ruptures. Hipposoft?s Physical Exam Essentials is an app that displays a detailed overview of patient exam techniques and procedures that can be used to emulate an actual physician-administered exam. Users can choose from a variety of categorical (cardiovascular, neurological, abdominal, etc.) exams. SpiroSmart is an app that reports the results of a breathing test that users take when calling a designated phone number. When prompted, callers simply exhale into the receiver, emptying the lungs of air. The sound is then analyzed offsite by SpiroSmart technology, and the corresponding results are sent to the phone via text message. The ResApp provides a similar service. Both diagnose and assess the severity of respiratory diseases, such as asthma and chronic obstructive pulmonary disease (COPD). The Lumify Ultrasound app uses an attachment to transform a mobile phone into an ultrasound device. The user places the connected attachment on the body to view organs, muscles, and the flow of blood on the phone?s screen. The app can be used to detect arterial blockages, growths, cysts, masses and pregnancy. The iExaminer app works in conjunction with an ophthalmoscope iPhone attachment to provide users with a digital imaging device. The user can photograph high-resolution images of the eye fundus and retinal nerve to be analyzed by the app to detect eye damage caused by hypertension or diabetes. The uHear, Soundcheck and Test Your Hearing apps enable users to test their hearing. Users simply listen to the tones with their existing earbuds and the apps generate results that can be used to assess hearing levels and detect hearing loss. The Kardia app provides an FDA-approved attachment for the iPhone that can take a 30-second EKG, capturing a snapshot of the heart?s electrical activity. EKG readings can detect atrial fibrillation, a condition that can lead to stroke, heart failure and other heart-related complications.